Na5Dy(MoO4)4 double molybdate phosphor was synthesized by solid state reaction method. Characterization of the prepared phosphor was carried out by X-ray diffraction, photoluminescence, absorption, diffuse reflectance, thermoluminescence and dielectric studies. X-ray diffraction studies confirm the tetragonal structure with average crystallite size of 60 nm. 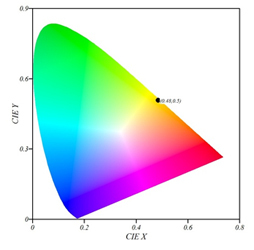 Photoluminescence spectrum shows intense emission peak at 579 nm corresponding to the transition 4F9/2 → 6H13/2 for bright yellow light. Thermoluminescence measurements show a broad glow curve with maximum centered at 107ºC after irradiating the phosphor by γ-rays. The dielectric properties such as permittivity, dielectric loss and a.c. conductivity were studied as a function of frequency. The structural, colour coordinates, band gap and trapping parameters were calculated from X-ray diffraction and optical studies.